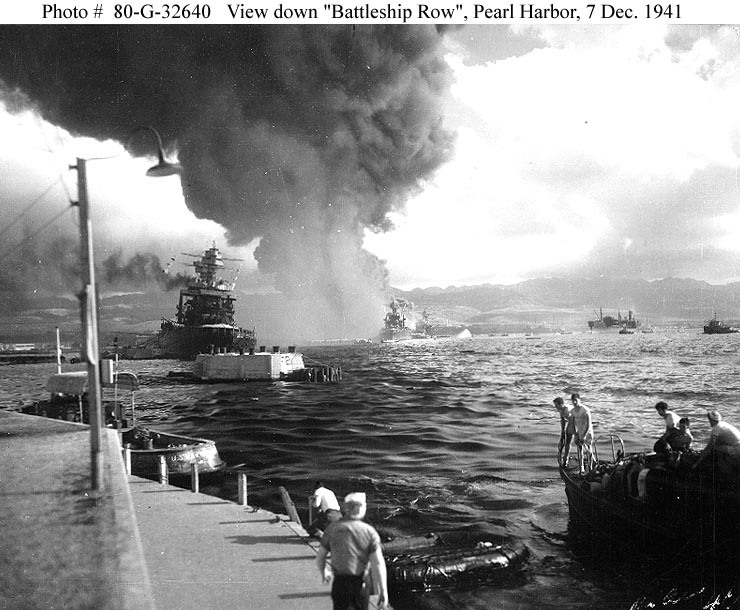 This page features surface views of the 7 December 1941 Japanese attack on Pearl Harbor's "Battleship Row". Among the critical elements seen in some of these views is a large pool of burning oil that drifted southward from the flaming wreck of the Arizona. This caused heat damage to the hulls of ships it passed and prompted a temporary abandonment of USS California. 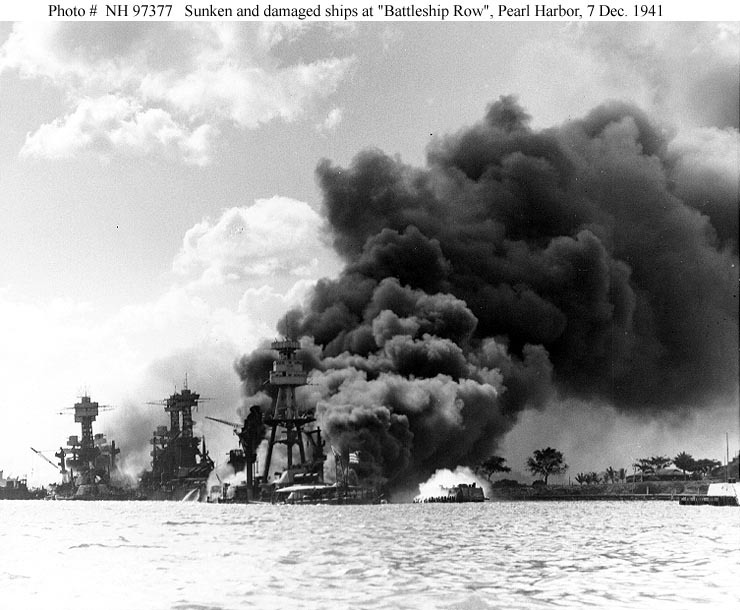 The Pearl Harbor Raid, 7 December 1941 -- Overview and Special Image Selection. 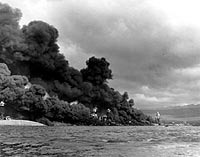 The sunken and burning USS Arizona (BB-39) is in the center. To the left of her are USS Tennessee (BB-43) and the sunken USS West Virginia (BB-48). 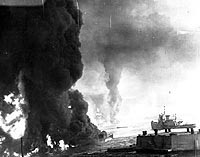 View of "Battleship Row" from the head of 1010 dock, during or immediately after the Japanese raid. 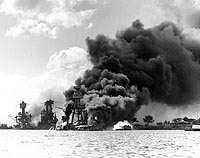 USS Arizona (BB-39) is sunk and burning at right. 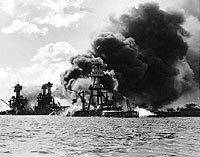 USS West Virginia (BB-48) is in the right center, sunk alongside USS Tennessee (BB-43), with oil fires shrouding them both. 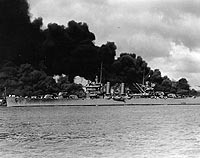 The capsized USS Oklahoma (BB-37) is in the left center, alongside USS Maryland (BB-46). Note wire spools in the right foreground, one marked "Crescent Wire & Cable Co., Trenton, N.J.". 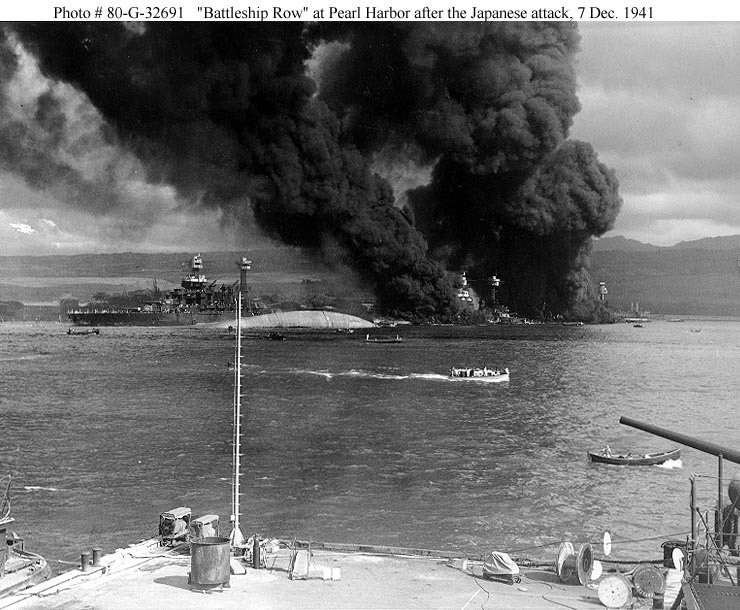 View of "Battleship Row" during or immediately after the Japanese raid. 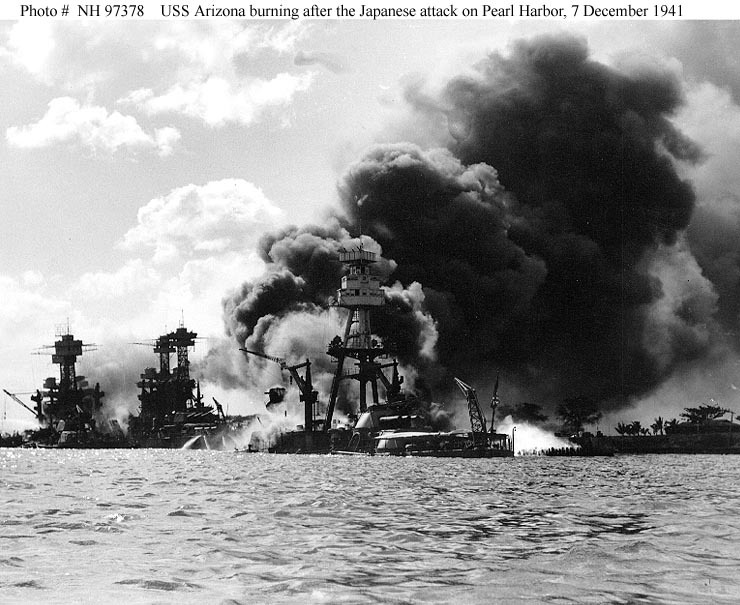 USS Arizona (BB-39) is sunk and burning at right. USS West Virginia (BB-48) is in the center, sunk alongside USS Tennessee (BB-43), with oil fires shrouding them both. 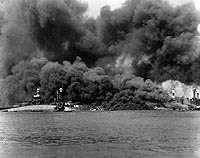 The capsized USS Oklahoma (BB-37) is at the left, alongside USS Maryland (BB-46). 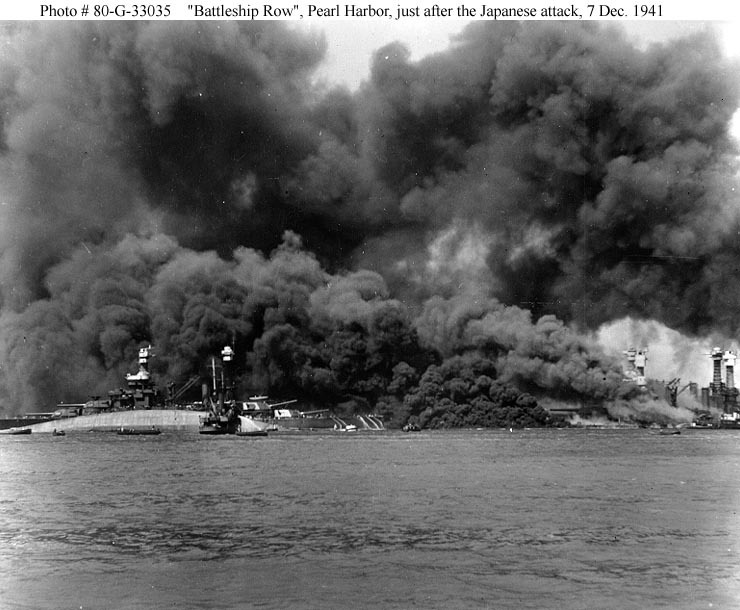 View of "Battleship Row" during or immediately after the Japanese raid. 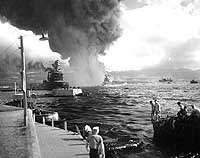 USS West Virginia (BB-48) is at the right sunk alongside USS Tennessee (BB-43), with oil fires shrouding them both. 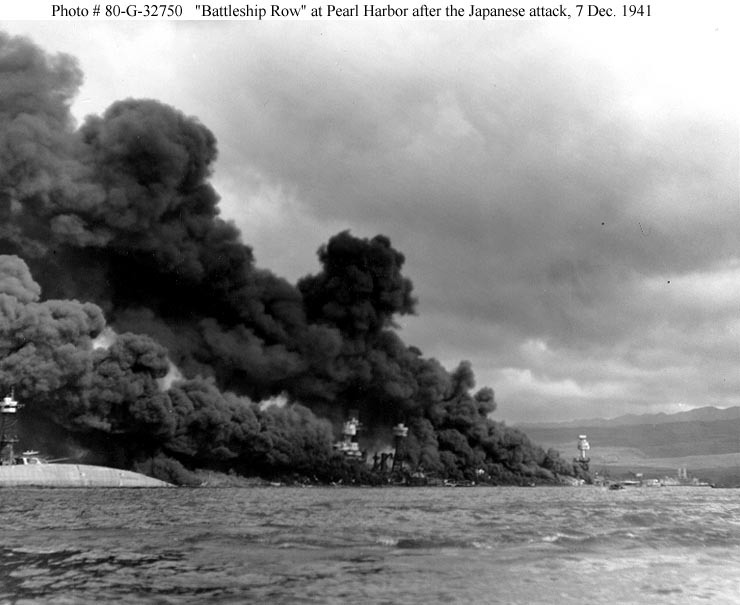 The capsized USS Oklahoma (BB-37) is at the left, alongside USS Maryland (BB-46). Crewmen on the latter's stern are using firehoses to try to push burning oil away from their ship. View looking down "Battleship Row" from Ford Island Naval Air Station, shortly after the Japanese torpedo plane attack. USS California (BB-44) is at left, listing to port after receiving two torpedo hits. In the center are USS Maryland (BB-46) with the capsized USS Oklahoma (BB-37) alongside. USS Neosho (AO-23) is at right, backing clear of the area. 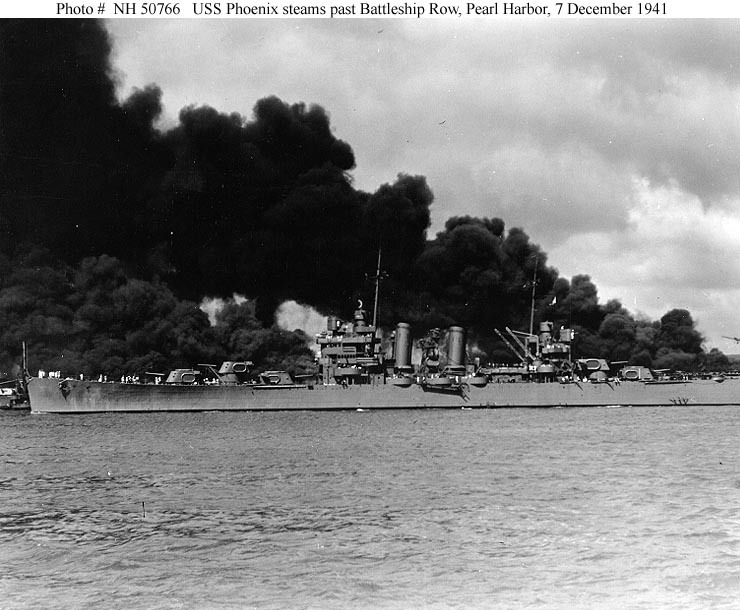 Most smoke is from USS Arizona (BB-39). 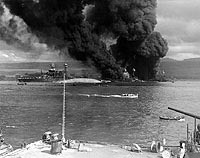 Oil fires burning on the water near Ford Island in the morning of 7 December 1941, shortly after the conclusion of the Japanese raid. USS Maryland (BB-46) is in the center background. A harbor tug is at right. 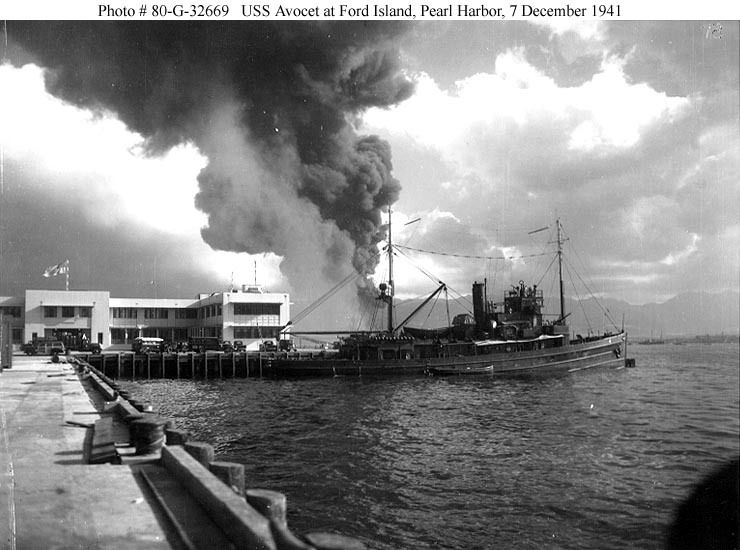 USS Avocet (AVP-4) at Berth Fox-1A, at Ford Island, prior to 1045 hrs. 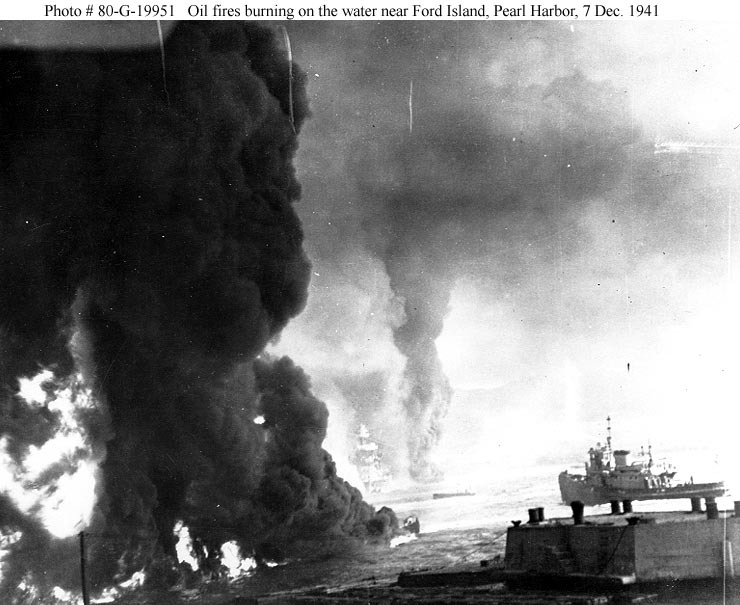 on 7 December, when she moved to avoid oil fires drifting southward along the shore of Ford Island. USS Phoenix (CL-46) steams down the channel off Ford Island's "Battleship Row", past the sunken and burning USS West Virginia (BB-48), at left, and USS Arizona (BB-39), at right, 7 December 1941.